FerryConnect is a new service we’re trialling to make commuting on the ferry easy. You can request an UberPool for just $3.50 to or from Manly Wharf – so you can share the ride and share the savings, on your commute! Participating suburbs: Manly, Balgowlah, Balgowlah Heights, Manly Vale, Clontarf, Fairlight, Queenscliff, Freshwater, North Manly, Seaforth, Curl Curl, Brookvale, Allambie Heights. Enjoy your UberPool ride, capped at $3.50! On your UberPool trip, you will receive a notification in app with a 20% discount code for Captain Cook Ferry. Apply the discount code in the Captain Cook app or in person at the wharf. UberPool is perfect for when you’re looking for big savings on your commute, capped at $3.50. You’ll be matched with other riders heading to or from Manly Wharf to make sure you get to where you need to be reliably and on time. Plus, upfront ETAs to your destination before you request means it is easy to plan your journey. Simply request an UberPool, then follow the in-app directions that will guide you to your pickup point. Share your Uber ride with other riders heading your way, not out of your way. And see your route as you ride. Arrive at your destination for a fraction of the price it would’ve cost with UberX. Share the ride and share the savings, on your commute. How do I receive the $3.50 capped UberPool trip on FerryConnect? This promotion will apply automatically in your Uber app. 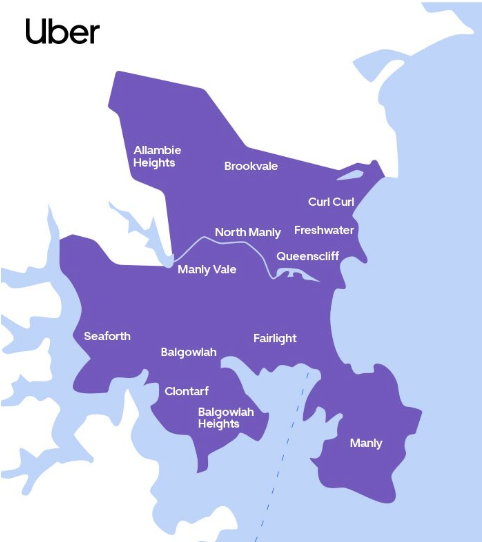 Make sure you are taking a trip with UberPool to or from Manly Wharf between 6am and 11pm, Monday to Saturday in the suburbs on the map above until 12 May 2019. What is the service area for capped UberPool trips on FerryConnect? On which ferry trips can I use my Captain Cook Ferry 20% off discount code? You can use your 20% off discount code for all Captain Cook Ferry single fares on the King St Wharf 1 & 2 near Barangaroo and Manly routes. Will the same Captain Cook Ferry discount code be in use for the whole FerryConnect trial? The discount code will change, so you should use your discount code after your UberPool trip. I didn’t receive a notification in app with my Captain Cook Ferry discount code, what should I do? Submit a support ticket in your Uber app by tapping menu > help and selecting the relevant trip. Uber app users who travel to or from Manly Wharf between 6am and 11pm Monday to Saturday, within the service area are eligible to receive an UberPool ride capped at AUD $3.50. The promotion will apply automatically in the Uber app based on the location of the Uber app user when they request an UberPool. The promotion is subject to the availability of UberPool in the service area. The capped ride excludes tolls, fees and additional seats. This promo is only applicable when the UberPool ride starts or finishes in these suburbs: Manly, Balgowlah, Balgowlah Heights, Manly Vale, Clontarf, Fairlight, Queenscliff, Freshwater, North Manly, Seaforth, Curl Curl, Brookvale, Allambie Heights (the service area). During the UberPool ride, a discount code for Captain Cook Cruises will be sent to the rider via push notification, which gives the rider 20% off single fare tickets on the Captain Cook Cruises Barangaroo Ferry to or from King St Wharf I & II. The rider does not need to use this discount code to receive the UberPool capped fare. The promo ends on Sunday, 12 May 2019.